If you’re in the market for your next vehicle, then you understand firsthand just how much effort goes into finding the perfect one for you. To start, you’ll need to figure out exactly what you’re looking for. Drivers have to decide what type of vehicle they need, and then they have to determine which features are necessities and which ones would be an added bonus. Our team here at Certified Autoplex specializes in used luxury vehicles, but we have a variety of mainstream brands available here on our lot as well. We’ve been working to provide detailed information for particular makes and models in order to make the car shopping process easier for our customers. One well-known luxury brand we carry is Audi, which is based in Germany. Audi offers everything from compact sedans to crossovers, SUVs and wagons as well as coupes and convertibles. If you’re looking for a vehicle that’s sure to make a statement and provide you with the ultimate comfort, then an Audi would be the perfect fit for you. 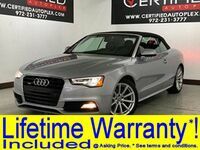 As of right now, we have more than ten Audi models to choose from on our lot here at Certified Autoplex. However, it’s important to keep in mind that our inventory is ever-changing. It’s always a good idea to check our online inventory before heading over to our lot for a test drive. Drivers looking for a traditional sedan with an impressive fuel economy and top-of-the-line features may be interested in the Audi A5. 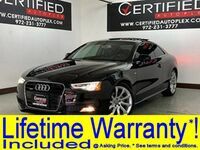 The few Audi A5 models we have on the lot come set with a lifetime warranty for peace of mind long after you drive off the lot. The Audi A5 is equipped with an efficient 2.0-liter 4-cylinder engine that averages 20 mpg in the city and 29 on the highway. All-wheel drive is also standard for both models as well as an automatic transmission. There are more standard features than we could list, but we’ll highlight a few. Drivers can expect safety features such as blind spot assist technology as well as heated seats and Bluetooth for entertainment. Those interested in learning more about the Audi A5 are encouraged to contact our team here at Certified Autoplex for more information. Drivers can get behind the wheel of this model, or any other vehicle, by scheduling a test drive online. Interested in a Used Audi A5?